Joseph married Isabel Marion Hogan in 1870 but she was to die only two years later, shortly after giving birth to their third child, Annie Elvira. Of their three children, both Annie and Anthony Stephen died in the 1920s, at 51 and 49 respectively, while their middle child went on to live until 1955, dying at the age of 83. In 1879, Joseph remarried, this time to Regina Gregory, in the same church in Calcutta in which his parents had married 57 years earlier. Members of the Anthony family depicted in this photograph, which must have been taken in or around 1897, were, from left to right: Alexander Gregory (1884-1933); Margaret Barbara (1883-1942); Malcolm Anthony (1859-1897); Joseph Manook (1847-1917); John Gardner (1886-1918); Anthony Stephen (1871-1924); George Edward Mosley (1872-1906); Annie Elvira (1873-1924); Isobel Marion (1872-1955); Elizabeth Catherine ((1882-1924); Robert Marcar (1891-1970); Edward Tozer (1871- 1920); James Markham Dow (1869-1910); Regina Gregory (1857-1942). Sir Frank Swettenham, who had been resident in the Malay Peninsula since 1871, was, subsequently, the Resident-­General (1896-­1901) and the Governor and Commander-­in-­Chief (1901-­1904) of The Straits Settlements.7 There’s little doubt that the Anthony family, being prominent citizens, would have known Sir Frank at a social and even a personal level. It is highly possible that the Governor, who was a former pupil (FP) of the Dollar Academy (then called the Dollar Institution) in Clackmannanshire, Scotland, recommended the school as a possible destination for the [male] Anthony children. The famous Dollar Academy in Clackmannanshire, Scotland. 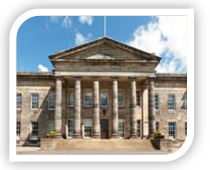 Established in 1818, it continues to this day as one of the country’s eminent independent schools. Marc attended the Academy from 1899 and remained at the school until 1910. He continued to live in Dollar until 1912, when he returned to Penang. It was quite apparent, even at school, that Marc’s interests lay in the musical and theatrical world. Evidence of this can be seen from his early-­acquired hobby of collecting photos and photo postcards of prominent actors and actresses. Indeed, many of his family and friends assisted him in building his collection by sending picture postcards to him at Dollar. Two of his most prolific correspondents were a “Daisy R.” and an “Alice”. 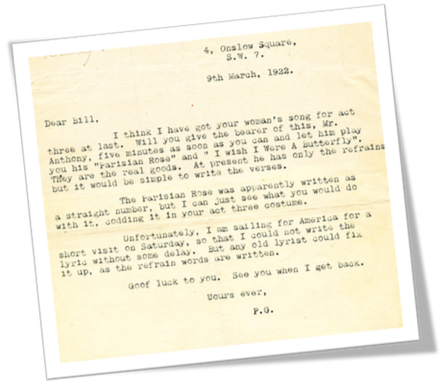 Since the early ones are addressed to him at Argyll House in 1904, it would appear that this interest in collecting such memorabilia began when he was around thirteen years old. Though Marc occasionally returned to Penang during the long school vacations, most of the time he would either remain at Dollar during the holidays or take up residence at the Davies Hotel in Brompton Square in London. Being in the heart of the cultural capital of the country at this stage of his life provided Marc with all that he could have wished for and he frequented the theatres and music halls at every opportunity. 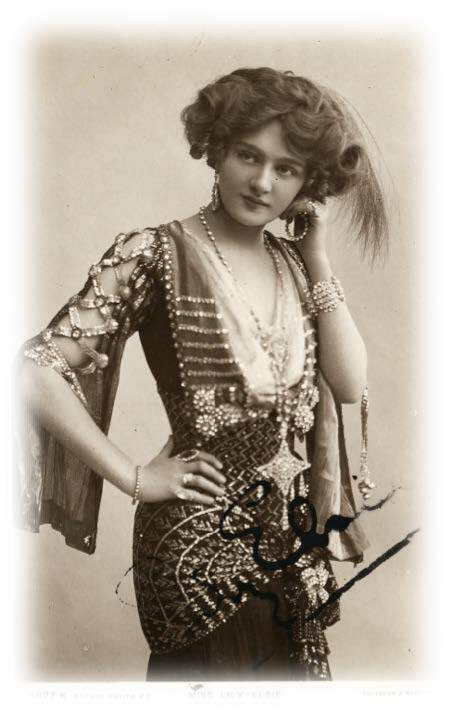 Lily Elsie as she appeared in The Merry Widow. 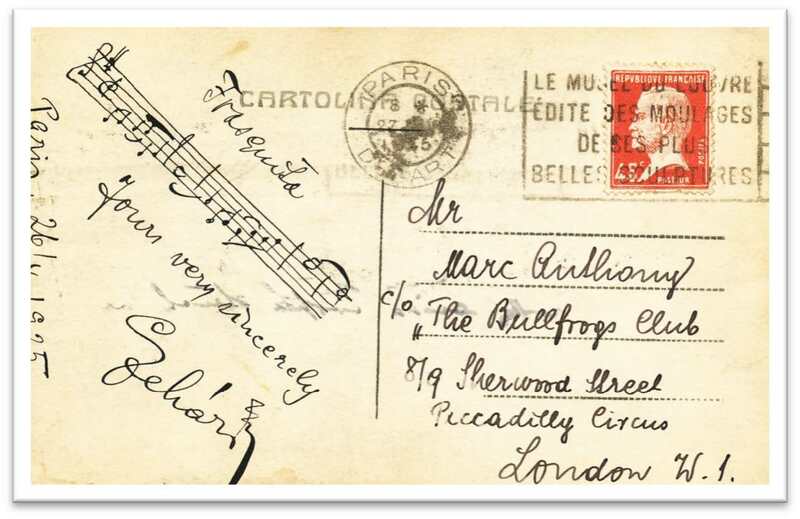 In June 1907, Marc attended the opening night of the London production of The Merry Widow by Franz Lehár. Not only did he fall for the music and thereby become a lifelong fan of the operetta, but he also enjoyed the magical performance of the beautiful star of the show, Lily Elsie. 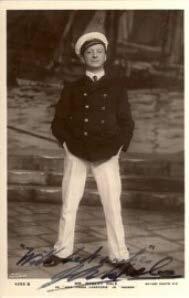 Marc attended 66 performances of the show during his 1909 school holidays. As Marc recalled, the final night of the long run of this show was so great that people paid £50 for a stall seat and the boxes were going for £100.10 It was perhaps a portent of things to come as he was to work with Lily in future years and they were to become close friends. It was enough for Marc at that time to realize that this was the style of music that he most warmed to and was to give inspiration to many of his later compositions. been busy at Bank with inspector. Will write next week & tell you all about the Cadet, Dance, Sports and Tennis Concert, in which I am taking part, all these things taking place this week. 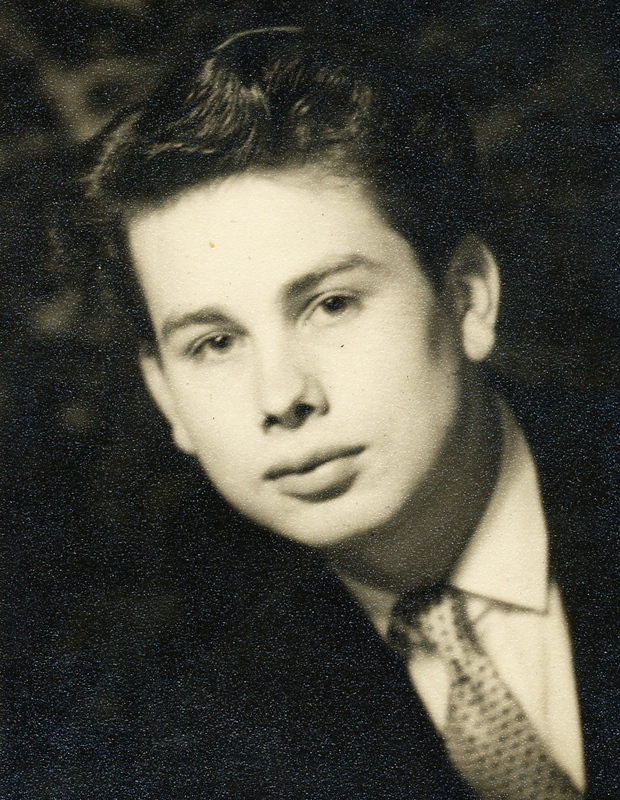 Marc, in a photograph taken when he was around the age of 21. 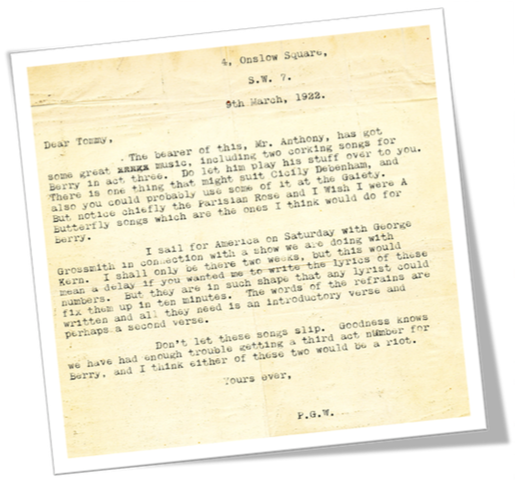 The last extant postcard that Marc received at Argyll House was dated February 17, 1912, and was a card to wish him many happy returns for his birthday. It was in this year, when he was 21, that he eventually left Scotland and returned to Penang. Marc’s musical talent was extremely unusual, as was foreshadowed while still at school. He had no formal musical training and, in fact, was unable to read or write music. However, he had perfect pitch, an extraordinary memory for a melody and the uncanny ability to play it on the piano once he had it in his head. Back with his family, and living at “Chatsworth” in Northam Road in Georgetown, Marc began to establish himself in the social and musical scene in his home town. He played piano professionally and set up his own small group of musicians, which became popular around town for special occasions. Although his father had hoped, as would most parents, that he would have returned to take up a position in the business, Marc was determined that this was not for him as he felt he had neither commercial aptitude nor inclination. As he was to recount many years later, he was made to try his hand at banking and accounting, but clearly had an aversion to both. 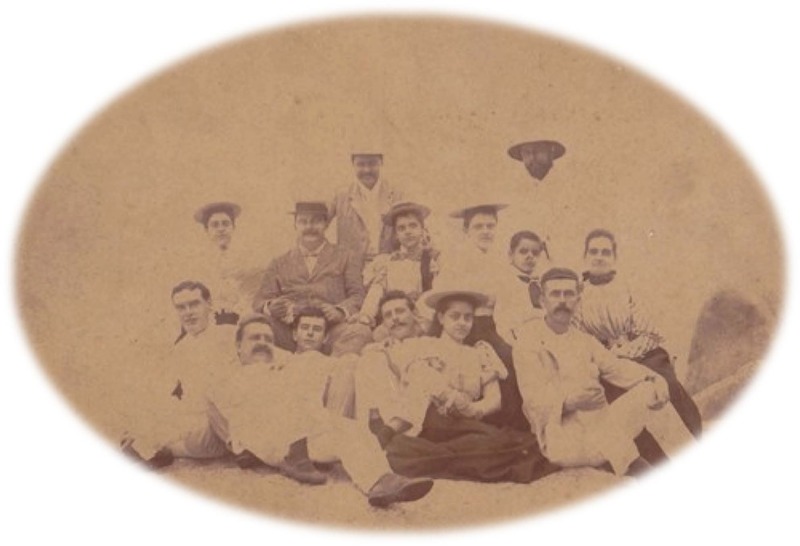 Through the good offices of fellow Armenians, the Sarkies brothers, who had set up the famous Eastern & Oriental Hotel in Penang, his father was able to help Marc find the opportunity to lead the band there and he became the conductor of the E & O Orchestra, which performed in the Palm Court of the hotel. This group was eventually to become the Penang Philharmonic Orchestra. will look forward to getting the music and will take great care of it and will be sure to give you my candid opinion!! I have just got The Dancing Masters waltz and vocal score. The waltz I think heavenly. It only came yesterday. Been having a heavenly time of it lately. Dot and Emmie lunched with us today; between the courses I played and they danced. Ripping fun. Dot loves this place. I played for The Importance of Being Earnest done by some amateurs for two nights. I played between the acts. Was at supper party at Newberries after play last night. Got home 2.30. Manook mad. Love RMA. The fact that Marc, now 24, referred to his father as “Manook” and that his father should have been mad at him for arriving home late, suggests a fairly strict and formal household, even for the Edwardian period. In 1919 [after the death of his father in 1917], convinced that there was no future for a budding musician in the Far East, and wanting desperately to focus on composing his own music, Marc set off back to England by ship, with a few hundred pounds in his pocket and his talent — the former coming from a generous legacy and, fortunately for him, having been born with the latter. His original intention was to take up the formal study of music once he arrived in London but, as we shall see, this never materialized. England in the early 1920s was still coming to terms with the end of the war. Those young men, and women, who were fortunate to have survived the horrors of the fighting and those others who had either lost their loved ones or seen at first hand the horrific injuries of the returning wounded, were looking at the world through the prism of their own mortality. Life was short and was now for living and they wanted to make the most of it. When Marc arrived in London, the boom in drinking clubs, coinciding with the inventive creation of a mixture, referred to as a “cocktail”, was changing the night scene in the major cities. The young affluent looked to these as an escape from reality and jazz clubs, speakeasies and many less salubrious venues were opening up in quick succession. But it was also a time of high unemployment and, for the next decade, things were only going to worsen as the industrial powers, which were facing outmoded and loss-making technologies, headed towards the Great Depression. As Marc returned to what he considered to be his real home, there was an extended period of strikes, a jobless rate that reached 2 million in England alone and a divided community that was split between those who had money to spare and those who couldn’t make ends meet. Not that all was doom and gloom. Society was moving from a predominantly low end manufacturing base to one that was benefiting from the growth of new scientific developments, audio-visual technologies and a wider access to all forms of entertainment, all of which were enjoying remarkable rebirth after the war years. Of particular benefit to a young musician arriving in London at this time was the fact that young people, enjoying a Bohemian approach to life and an attitude of “anything goes”, were flocking to dance halls and listening to dance music on the radio and the gramophone. Light music, just the kind that Marc was appreciating and writing, was the rage and he was able to fit right into the swinging London social scene. Glebe Place in the 1880s was internationally famous as the arts centre of London. In Glebe Place Studios, half way down the street, artists such as Walter Sickert and William Rothenstein and the book illustrator Ernest Shepard took up residence and Francis Bacon lived at 1 Glebe Place in the 1930s.16 It is unsurprising that Marc felt very much at home in this part of Chelsea. Mr Anthony works by ear alone and it is notable that he rarely loses a melody after it has occurred to him. He uses a musical shorthand of his own invention. It was in 1921 that Marc decided it was time for him to have someone not only to negotiate his terms (which he knew he was incapable of doing effectively) but also to find him work. He approached Leslie Cardew of 23 Gerrard Street, who took on the role of his business manager. 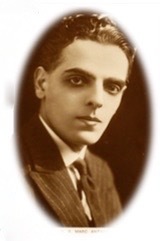 Marc Anthony in his first professional photograph in the early 1920s. But living in London and waiting for the day of recognition was never going to be easy. Despite his many supporters and the wide recognition of his talent, this was not bringing in the bacon and Marc needed to find regular work that would provide him with both a steady income as well as the flexibility to compose and develop his skills. although he has not been here long, he is already establishing himself as one of the creators of light music and those who are judges are realizing that here is a personality of which some notice must be taken. Discreet but stimulating clubs, often skating close to the edges of the licensing laws, flourished in London after the 1st World War. 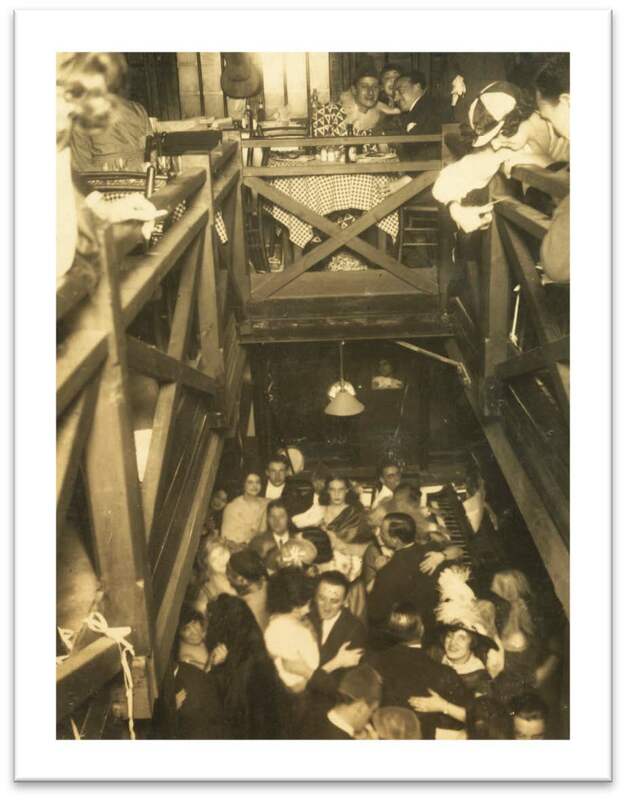 Over 50 clubs, which were largely patronized by socialites and young people looking for a good time, operated in the city in the early 1920s. Of course, they were also attractive destinations for the performing arts professionals who would find them a fun-filled respite after the evening shows. The Kit Kat Club was perhaps the most famous but, close behind, was the 50/50 Club, which was owned by Ivor Novello. 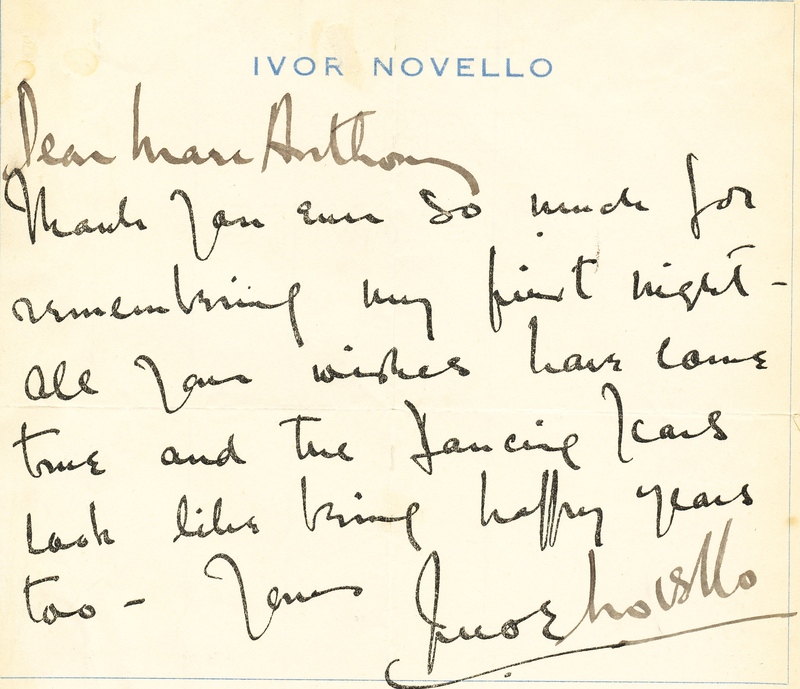 It was rumoured that the name reflected Novello’s ambiguous sexuality. There was also Rector’s on the Tottenham Court Road and the Gargoyle in Meard Street. Amongst this plethora of meeting spots was The Ham Bone Club, at which Marc Anthony became a musical feature during 1922 and 1923. The Ham Bone Club. Marc can just be seen at the piano on the ground floor in the right-hand corner. There comes a phase in the life of the hardened night-bird when, sated with the pomp and circumstance of dress shirt and decorum, and longing to be entirely natural and to smoke a pipe for a change, he seeks to creep away to the place where all men are equal and at ease. In such a quest, he finds “The Ham Bone”. From the Circus of Signs you dive into the dark waters of Ham Yard, wherein plutocrats park their cars and at the insidious door in the corner you put away childish things of the West End, cease looking darkly through the glass of fashion and see face to smiling face — with all your sisters! Be under no illusion that, because you may live in Park Street, and drive to Goodwood in a nickel-plated Rolls, that you can stroll placidly into The Ham Bone Club on the strength of your pass-book. There will be nothing doing. The Cerberus halfway up the narrow stone stairs will stare blankly at you. You may, if the gods are kindly disposed, be taken there by a member and then you will see, possibly for the first time (which will do you a power of good) what a leveller of the social status true Bohemia can be. We are no respecter of personages. Our motto is “Live and Let Live” and we enjoy a short life merrily in what was once an old warehouse lying glum behind the glitter of Piccadilly but which, artistically camouflaged, is now our small and intimate dance club. But of our charity let us remember that we are at least unique. Some of us may have faces, which repel what we should call threepenny ha’penny journalists. Yet we have a high camaraderie and a low subscription. And we are proud of it. Scipios, of the yellow plush and plutocracy, cannot say as much as that. Not even the Emblematic, which typifies to us nothing but Bradburys and boredom. We are above and beyond them all, because we are cheap and exclusive. Whereas they — they are rich and repulsive. Rather a devilled kipper for ninepence and a kiss to follow, for which there is no payment save affinity, than a lobster cardinale and confusion, when the bill is unfolded. And our faces? Well, those who don’t know them, don’t miss them. But those who can’t see them when they want to (which is often) miss them horribly. Ask our friends — and our lovers. This then was the establishment to which Marc gravitated and of which he was to become a singular personality and where he was to create his own magical corner in which to build a following for his music. Robert Hale (1874-1940). British actor and star of revues and musical comedies; father of actors Sonnie and Binnie Hale. Robert Hale, who was also in the cast, presented Biffy at the Garrick and it was a very successful though trivial comedy. 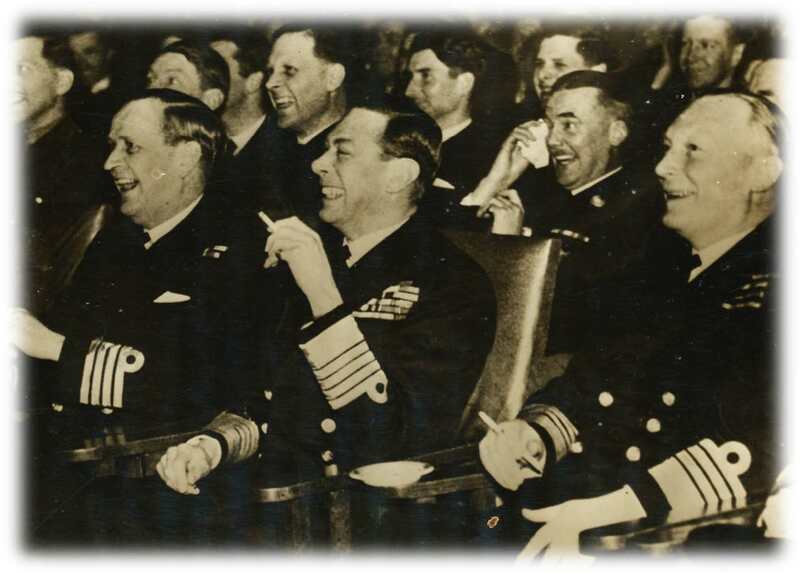 According to a review in The New York Clipper, the plot dealt with two partner husbands, who, in order to have a good time, invented a business interest in London, with a partner there called Biffington, better known as Biffy. However, the Biffy of their imagination becomes a reality and the real Biffy imposes on the two gentlemen certain obligations that turn to farce. Also in the cast were Stanley Cooke, Charles Piggott, Maude Hope and Dorothy Fane.30 One is tempted to say that the plot is closely reminiscent of Oscar Wilde’s The Importance of Being Earnest! The success of Biffy and Marc’s particular musical contribution drew the attention of the theatre manager and impresario, Albert de Courville. In early May 1922 they arranged to meet and de Courville not only bought three of Marc’s songs but also gave him the lyrics to a song called “Hustle With Your Bustle” and asked him if he could write the music to it. The Ham Bone Club, which had opened only a few months before Marc became the resident pianist, was originally founded and presided over by the painter Augustus John and, through him, attracted a largely artistic and certainly hedonistic clientele. Radclyffe Hall, the celebrated writer was a frequent visitor, as was Ethel Mannin, the author and travel writer, who was supposed to have enjoyed dancing there and described the place as “chronically Bohemian”.37 Now that the Charleston dance had found its way from America, it became quite clear that the small dance floor of the club was quite inadequate to provide sufficient space for the new craze. So, in July and August 1923, having become a victim of its own success and due to its popularity, it closed for renovations to be opened again on September 1. Many of the Bohemian regulars contributed ideas to the new décor and, in fact, Marc suggested the colour scheme for the new crockery in the restaurant. 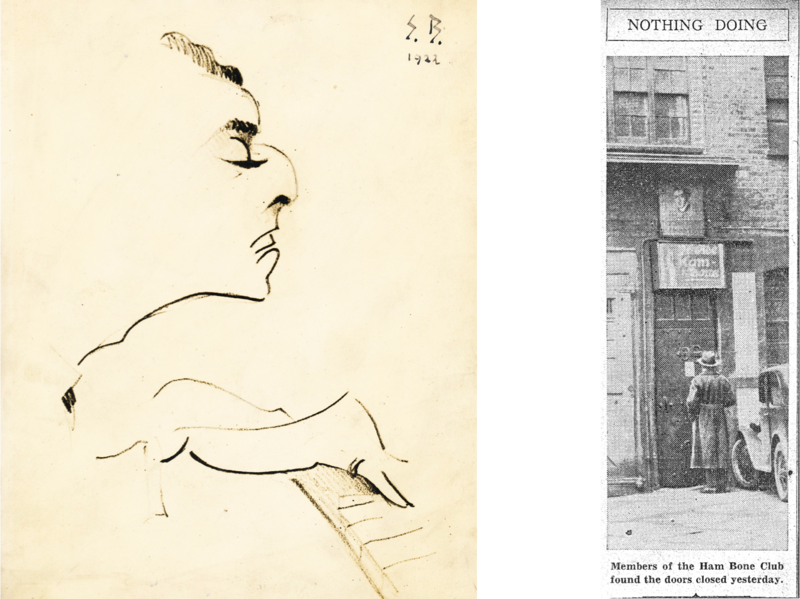 The Sava Botzaritch caricature of Marc (left), which hung on the wall of The Ham Bone Club, and The Ham Bone Club closed for renovation (right). While all this was going on, one of Marc’s earlier pieces, “Parisian Rose”, which had been highly recommended by P. G. Wodehouse, was to form part of the “Rector’s One O’clock Revue”. Cabaret had been growing in popularity and the Rector’s Club on Tottenham Court Road was the centre of this popular form of entertainment. Carl Hyson, the Canadian-born husband of actress and singer Dorothy Dickson, was one of its leading producers. Also on the bill at the performances held in the autumn of 1923, was May Vivian, the accomplished dancer, who had recently been appearing in the Cabaret Follies. Shortly after her appearance at Rector’s, she was to be tragically shot dead in the South of France by a jealous suitor during a season in which she was appearing at the Riviera Palace Hotel in Monte Carlo. Performing Marc’s “Parisian Rose” was Cecile Maule-Cole. 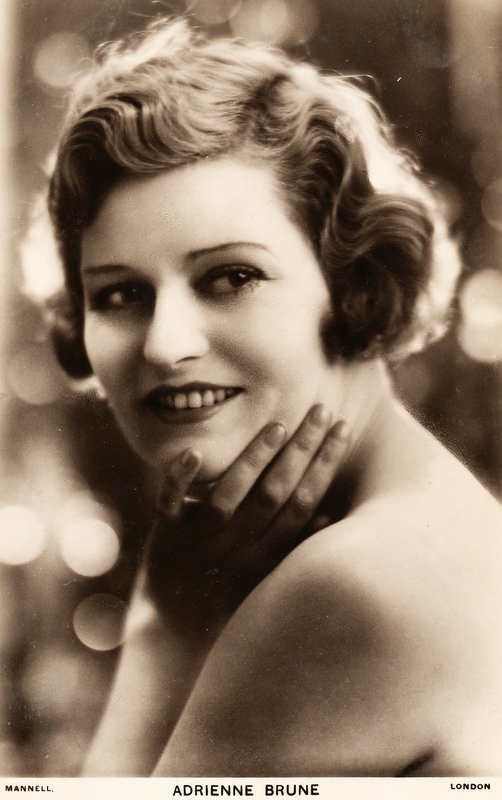 She had appeared in the original London production of Cabaret Girl the previous year; was to star in Poppy in London in 1924 and 1925 and go on subsequently to perform in the Ziegfeld production of Noel Coward’s Bitter Sweet on Broadway. The “Rector’s One O’clock Revue” on this occasion finished with a grand finale, in which the whole company performed “Parisian Rose”. an amusing place, which you reach down an alleyway and up a twisted iron staircase and, in the corner of the centre room, Marc Anthony, vibrant as a banjo wire, holds his crowd with piano as firmly as Lopez holds his with a full-size jazz band. A diner de l’opera is necessarily short, and the chef usually names his dishes after the opera stars or the leading characters. The light dinner in turn necessitates a souper de l’opera after the curtain-fall, possibly in one of the Bohemian restaurants or dancing clubs of Soho, say the Bullfrogs, where the midnight kipper is served, or a comfortable dish of bacon and eggs. Miss Eve Grey, the young Australian beauty, who has just scored a success at Daly’s Theatre by virtue of her fresh charms, is one of the patrons of the Bullfrogs. The club caters for stage and literary or musical folk, who unite an interest in art with happy Bohemianism. A couple of hours song and dance at a little Soho night club is a welcome relief after six hours of the Götterdämmerung. a luminary of our own small but growing Tin Pan Alley. He has done numbers for Charlot’s new revue. Daphne Pollard is putting over a fox-trot song of his in the very heart of New York’s jazzland, in the Greenwich Village Follies. “Dancing Jim” and “Hustle With Your Bustle” are two more of his winners. One of these days you will probably hear an enormous burst of revelry from the Bullfrog. It will be the Bullfroggers celebrating their pianist’s arrival in the ranks of the jazz kings with a thing as tremendously successful and lucrative as “Tea for Two”. Advertisement for Still Dancing featuring part of Marc’s “South Sea Blues”. 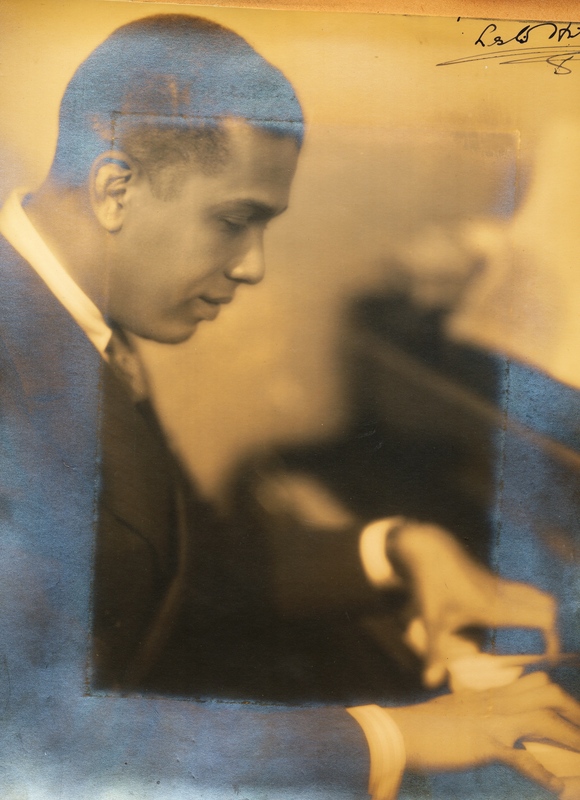 By the end of 1925, there were compositions of Marc’s in shows on both sides of the Atlantic. Charles B. Cochran’s new edition of On With The Dance, which he called Still Dancing, at the London Pavilion featured his “South Sea Blues”43 and his “Pyjama Rag” one-step. He had also written numbers for a new musical play called Riquette, which was on at the Glasgow King’s Theatre. These were “Picasse” and “When the Telephone Bell Rings”. 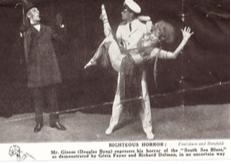 Performers Douglas Byng, Greta Fayne and Richard Dolman putting the foxtrot “South Sea Blues” into dramatic form. 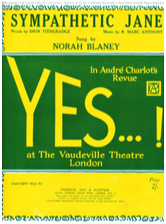 Yet another piece, “Teach Me To Dance” (see Appendix for sheet music), was featured in Yvonne, which was written by Percy Greenbank, Jean Gilbert and Vernon Duke. It opened at Daly’s Theatre off Leicester Square in May 1926 and, after its London run, it went on tour throughout the country. In the same period, some of Marc’s music appeared in Suzette, which was playing at the Gaiety Theatre. One of Marc’s early childhood ambitions had now come to fruition. In an article entitled “My Daly’s Dream” which was published in Music Masterpieces in 1936 he mentioned that, after seeing “The Country Girl”, his first experience of musical theatre, he one day wanted to write music for a Daly’s play. Here he was, at the age of 33 with his earliest dream realized. 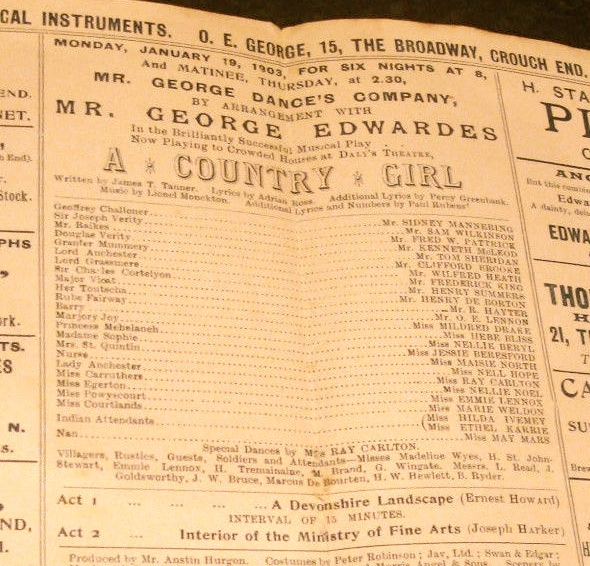 “The Country Girl” had opened at Daly’s in 1902 and had run for 729 performances. The music was written by Lionel Monckton and was the first of his many hits. This suggests that a very precocious Marc had travelled to London and seen this show when he was barely a teenager. It is hardly surprising that his love of the musical theatre and London began at such an early stage and now, some twenty years later, his own music was being played at Daly’s. On Boxing Day in 1925, it was announced that the New York producer, Arch Selwyn, was to sail for London to discuss with Cochran the transfer of On with the Dance to the States for an autumn 1926 production.44 This was clearly good news for Marc, whose music was now getting greater recognition on both sides of the Atlantic. He does it once a year so that he may gloat over his freedom during the remaining 364 days! probably the most Bohemian parties in London are those given by Marc Anthony in his Chelsea studio. They are always held on Sunday afternoons. there was a truly Drury Lane pantomime magnificence about the costumes and the show marked a further advance in the increasing elaboration of this kind of entertainment. Many of the numbers for the show were composed by Marc and his widely popular highlight was “Silvery Dreams”, performed by the dancer and mimic Jean Rai. In the following month some music he had previously submitted was included in Billy Merson’s musical comedy My Son John, which arrived in the West End after a preliminary tour outside London. The renowned Vivian Ellis wrote another piece in the show. Vivian Ellis was already a popular composer and was to go on to write “Spread a Little Happiness” and “This is My Lovely Day”. Back at the Bullfrog Club, where Marc continued as ever to provide his music in his own characteristic manner, another move was on the cards. When he began at the Club it was at a premises on Sherwood Street, very close to Piccadilly Circus. In 1926, it moved to New Burlington Place. An autocratic but magnetic fixture of the Bullfrog was the owner, Emile, who was famous for having a rather droll sense of humour and for complaining that her clients were overstaying their welcome. Nevertheless, her attitude seemed not to discourage the customers and may well have been one of the reasons why they kept coming back. When the Club re-opened in New Burlington Place, Emile changed the name to the “Lamp Post Club”. In 1927, Marc was to come into contact with the pinnacle of London’s theatrical royalty when he was asked to write special music for a Percy Athos presentation at the New Prince’s Frivolities of S. N. Behrman’s The Second Man. Produced by Basil Dean, who was to go on to become one of Britain’s great film producers, this comedy featured Noel Coward, Zena Dare, Raymond Massey and Ursula Jeans.54 The double bill, which was hugely successful, opened at the Playhouse Theatre on London’s Embankment and then, subsequently, transferred to The Hippodrome. As a result of their collaboration on this production, Marc and Noel Coward became firm friends and remained so until Marc’s death just two years before Coward passed away. Coward was often to be seen at Marc’s Sunday afternoon tea parties relaxing unceremoniously (and somewhat uncharacteristically) on cushions on the floor. Towards the end of 1927, the score of a new musical comedy, The Cinderella Fellah, had emerged from Marc’s imagination and now only needed a production to see it flourish. The book was intended to be developed by Peter Jackson but was eventually written by Edward Dignon and Geoffrey Swaffer, who happened to be the brother of the art critic, Hannen Swaffer.55 It was at this time that Marc collaborated with Bruce Sievier, the racing correspondent of the Sunday Independent, to write some songs, one of which was called “I Thank the Moon” (see Appendix for sheet music) and which was to be included in the show and later published by Keith Prowse. Marc and Bruce were to go on to collaborate on many future numbers. By the end of 1927, Marc had been living in London for seven years and had enjoyed a good deal of musical success with dozens of songs enjoying growing popularity. Of necessity he was augmenting his income by playing most nights in the cabaret clubs of central London. There was little doubt that his reputation was thriving and that he had cemented a position for himself in the musical dynamic of the city. His electric and charismatic personality endeared him both to the Bohemian as well as the more conservative layers of society. Mr R. Marc Anthony, a portrait of whom we publish here, is the only composer of truly melodious light music that the English stage has produced in the last decade. Each night Mr Marc Anthony is to be found delighting the only group of real Bohemians in London at the Bullfrog Club — where, as pianist and cabaret entertainer, he has earned a reputation that is absolutely unique in its popularity and this amongst those who are truly able to judge merit at its face value. Some of his ballads and dance music have already brought him considerable success and, indeed, he has been described by possibly our greatest librettist as the Jerome Kern of this country. Carl Hentschel, the famed photomechanical technician, had started the Playgoers Club in 1893, as he was an avid theatregoer and professed to have attended every opening night in London.56 However, at some point, on a matter of policy, he and others split from the club and set up an alternative, known as the Original Playgoers (O.P.) Club and, as such, continued to hold annual dinners, attendance at which was very much in demand. Marc and Lang Silvestre make music at the Lamp Post Club. 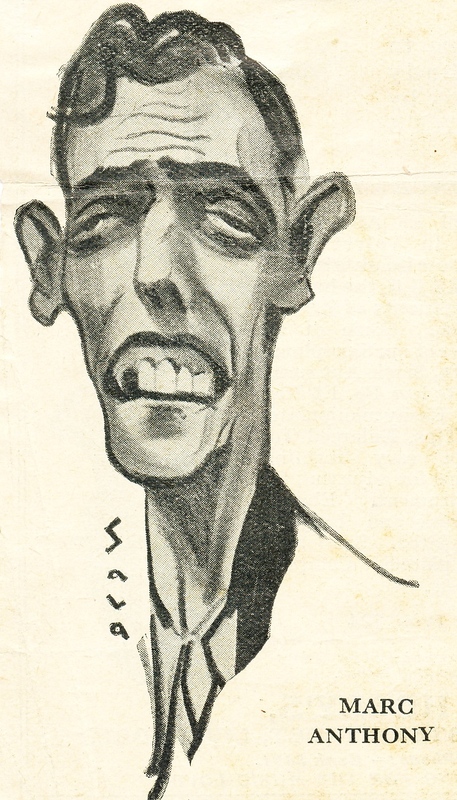 Sava’s second caricature of Marc. I am assured that “Balalaika Music” will be a sensation … all it wants is a manager to take Marc Anthony’s music and Bruce Sievier’s lyrics and build up the rest. Strange coincidences can be valuable or disastrous and Marc was faced with the latter when serious moves were made in 1928 to produce his music for The Cinderella Fellah. It turned out that, simultaneously, Owen Nares, Bobbie Howes and Binnie Hale were working on a production of Mr Cinders, which was based on the same concept of having a male Cinderella, although their interpretation was a straight play as opposed to Marc’s musical comedy version. Adrienne Brune, friend of Marc and frequent performer of his music. young ladies whose soft accents are an echo of Mayfair and of young gentlemen of the literary student type, who discourse learnedly on Shavism and censorship. It was during this year that Marc became one of the first “stars” taken on by Marjorie Pratt, Countess of Brecknock, who had decided to go into music publishing and had taken a shine to Marc and felt that his music was exactly the sort of light stuff she was looking for. Despite Marc’s continuing success in writing what many thought were great numbers, he simply wasn’t getting the traction he deserved and the blame for this was frequently put at the feet of managers who preferred to import American music, which they saw as safe and with greater profit potential. There was also the tendency for the BBC, which was broadcasting music for many hours a day by this time, to feature American rather than locally grown talent. Even the Brecknock’s Music Publishing Company had to take time on Paris Radio to get their English music played. an American composer comes to London and stays at the Carlton Hotel, drives about in a Rolls Royce … peers and minor royalties entertain him and ask him to play after dinner … he earns £20,000 − £40,000 per year … why, Jerome Kern is so rich that even his collection of books fetched £360,000. … Irving Berlin is so wealthy … George Gershwin is a social lion … meanwhile the English composer is unrecognised. How can an English composer get work in England when the theatre is becoming more and more a branch of the American musical comedy trust? … Marc Anthony, one of the most brilliant young composers, is now playing the piano at Soso’s restaurant although his beautiful music has not been given a chance. musical comedy today is not a theatrical show but a mere branch of the music publishing business and … ruined by song-plugging. nothing is harming this country so much as the Americanisation of our youth, through the medium of the theatre and the picture-house. In February 1929, yet another new night club set up at No. 14, Ham Yard, Soho, called the “Blue Lantern” and was officially opened by Marc’s friend and actress Adrienne Brune. For a while, he took over the role of pianist at this club. In the writer Anthony Powell’s autobiography, Messengers of Day, he describes the place as fairly seedy; below the Gargoyle in status but, nonetheless, bearing a faintly intellectual tinge. Powell then goes on to celebrate the night at the club when the American actress Tallulah Bankhead asked him to dance with her. 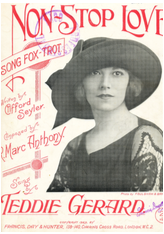 Marc was continuing to write music and, by early 1930, was also playing at Soso’s Restaurant where Josephine Earle, with whom he had worked previously, was appearing. He had written several other pieces including “Lady of My Dreams”, which was to enjoy great popularity. Subsequently, Marc moved to the Bat Club in Albemarle Street. an entertainment that is notable for good work in every department and special effective staging and dressing. One of the most celebrated restaurants in Paris that attracted and welcomed through its doors the Bohemian artists and writers living in or visiting the city was La Petite Chaise at 36 Rue de Grenelle. At the end of 1930, Marc took up winter residency for a while at this venue and presided at the piano from dinner into the early mornings. A scene from the Producers Distributing Company film, The New Hotel. negligible story but that the turns, which include an excellent apache dance and some trick roller skating, are very good of their kind. 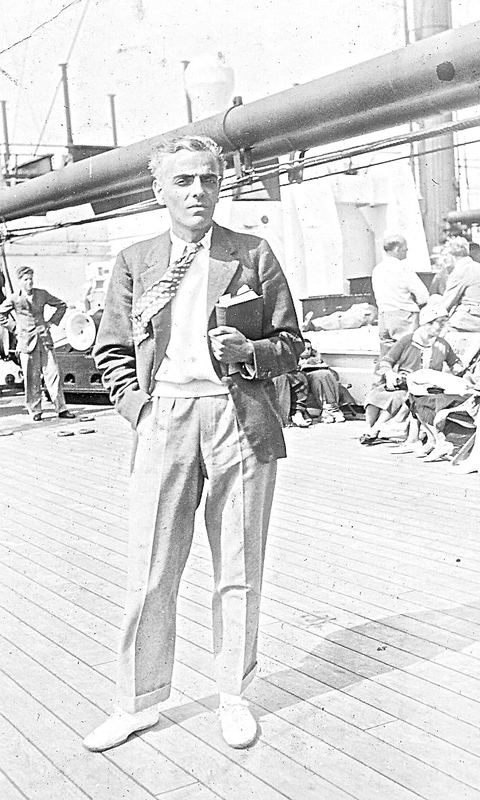 Marc aboard the “RMS Corfu”. However, in the same year he also took himself off for a vacation in Tangiers, which had become a popular destination for the London set to go and let their hair down and enjoy an often self-indulgent escape, less worried by the more straight-laced mores of English holiday resorts. 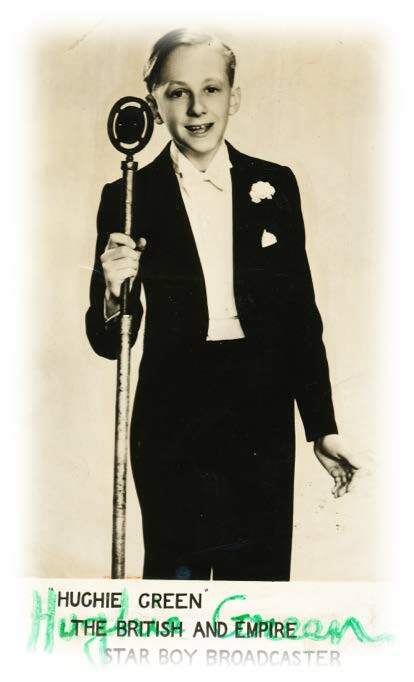 Marc’s night club duties continued and even increased during the early 1930s and he was to be found not only at the Bat Club but also at the Cossack Restaurant in Jermyn Street, where he performed in the Cossack Bar during cocktails and then again in the restaurant at midnight. Marc’s musical attachment to the Cossack was to last several years. 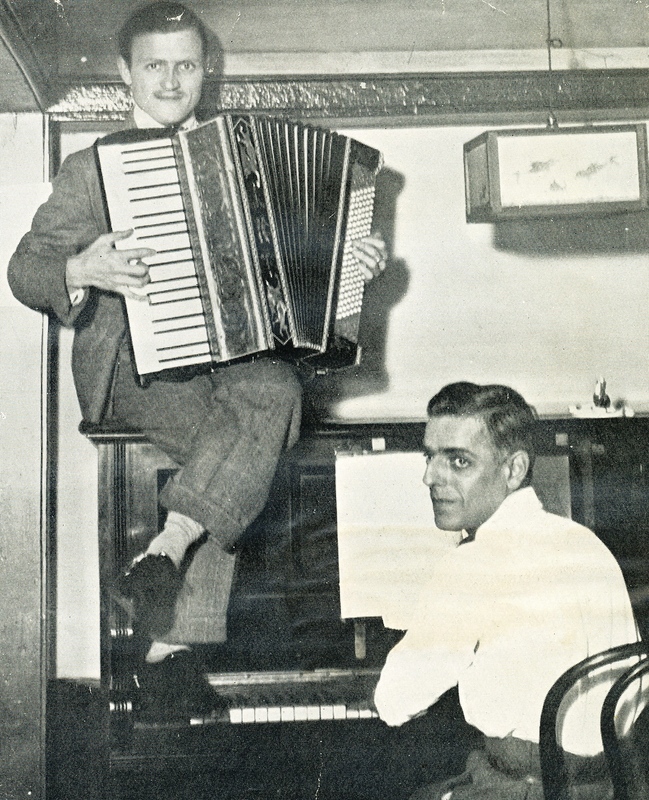 He was also for a time the resident pianist at the Dorchester Club in Grafton Street and made special appearances at others, such as Ciro’s Club where, in November 1933, he accompanied Anton Dolin in his “Song of the Dance”. In February 1934, Margaret Cochran sang some popular numbers accompanied by Marc in “Our Cabaret” at the London Pavilion and, in the same year, Marc was one of several artists to perform before the soon-to-be Queen Elizabeth at Dean’s Yard, Westminster, at a market held in support of the Westminster Hospital rebuilding scheme. On this occasion he played one of his own compositions for the future Queen and her retinue. 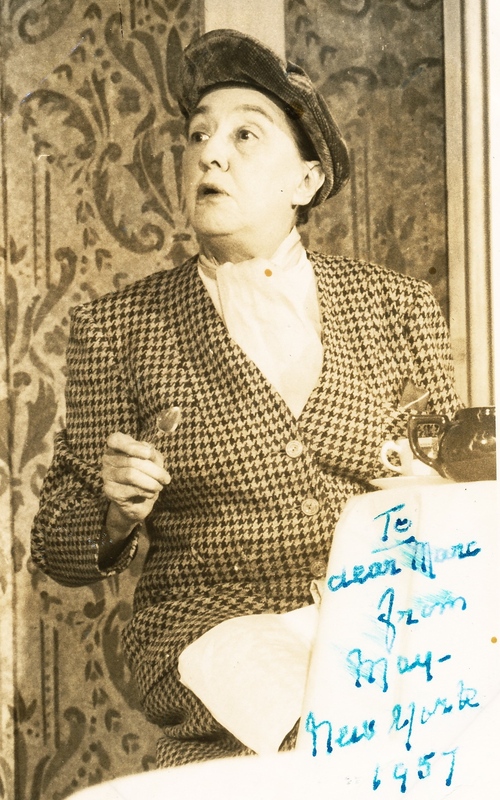 In October, Cecily Debenham, regarded as one of the great comediennes of her time and about whom P. G. Wodehouse had referred in his correspondence about Marc some fourteen years previously, was holding a party at her house in Connaught Square at which Marc had been invited to play. He performed music to a new show he had written with Bruce Sievier based on a book by Frederick Carlton. Once again, everyone agreed that they were listening to a very talented musician who should have been enjoying the financial fruits of his success and not augmenting his income by playing in night clubs and restaurants, no matter how much he enjoyed doing so. 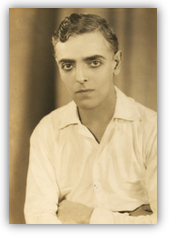 A very young Hughie Green. 14 years — my first evening dress suit. This I had made when with the “Gang”, made my first stage appearance. June 1936 was to see Marc at the Grosvenor House Hotel accompanying Anton Dolin once again in a selection of gracefully athletic dance routines. Jack Harris’s Grosvenor House Band was a regular at the Park Lane hotel and, after the more sophisticated music of the evening in the restaurant, the hotel opened its ballroom to the Midnight Vanities, which was normally a far more energetic show than Dolin’s and certainly displayed a greater amount of flesh! Shortly after this show, in August, Marc played as guest pianist at a review in Copenhagen, Denmark, using some of his own music. The BBC only broadcast from 10:00 in the morning to closedown, which was at around midnight. The programme in the afternoon at 3:00 was usually a short feature on a range of subjects from fashion to health exercise or snooker. But occasionally they had a performer and, in April of that year, they had already broadcast short performances by Ingrid Lincke, soprano, and Fredrika, mezzo soprano. On Thursday April 29, in a programme entitled “The Composer at the Piano — Marc Anthony”, he played some of his melodies.80 The following month, of course, the BBC produced its first outside broadcast, which was the Coronation of King George VI. 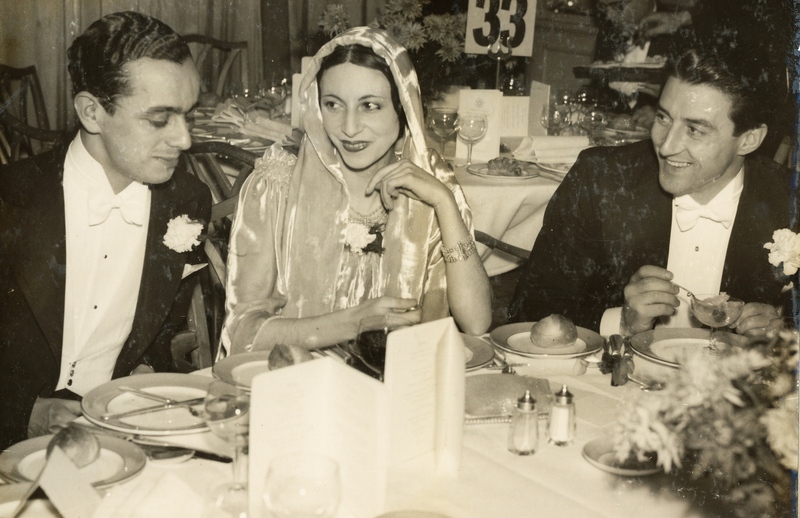 Marc (left) enjoying a formal evening with his friends, the prima ballerina, Alicia Markova and the ballet dancer and choreographer, Anton Dolin. Marc worked with his good friend and colleague, Anton Dolin, during 1936 and 1937 on a new show that the Markova-Dolin Ballet was producing as part of the Company’s Coronation Season, which saw it appearing both in the UK and overseas and which would include Markova and Dolin themselves and Dolin’s new pupil, Belita, dancing to Marc Anthony’s “Debut”. The dancer and athlete, Belita. Prior to this season of shows, in which was included “A Poem”, specially written by Christopher Vassal and spoken by the actor, John Gielgud, Dolin and Marc travelled to Venice to stay at the Excelsior Hotel before heading off for a few days in the Austrian Tyrol. At the end of 1936, Marc asked Eric Maschwitz, head of the Programme Division at the BBC, if he would like to hear his score of a musical play Maschwitz had written called Balalaika. However, on receiving it and reading the libretto, Maschwitz responded by saying that he did “not think it in the least suitable for broadcasting” and that it did “not contain any startling novelties nor is the dialogue particularly outstanding”.82 Despite the popularity of his music in the nightclubs and on stage, it did not seem to receive the same degree of enthusiasm from the broadcasting media. There is a touch of irony in the fact that Marc was later to become a good friend of Hermione Gingold, who, at this time, was married to Eric Maschwitz, but from whom she divorced in 1945. Despite the rejection of his music by the BBC, this did not prevent Marc from doing the occasional radio and television appearances but they were more often than not in the form of an interlude between programmes. An example of this was on September 30, 1937, when he appeared briefly for a 5-minute session, playing his own repertoire, between “Round the Film Studios” (a visit to Pinewood to watch the making of a picture) and “Clothes-Line 1” (discussing the importance of dress!). 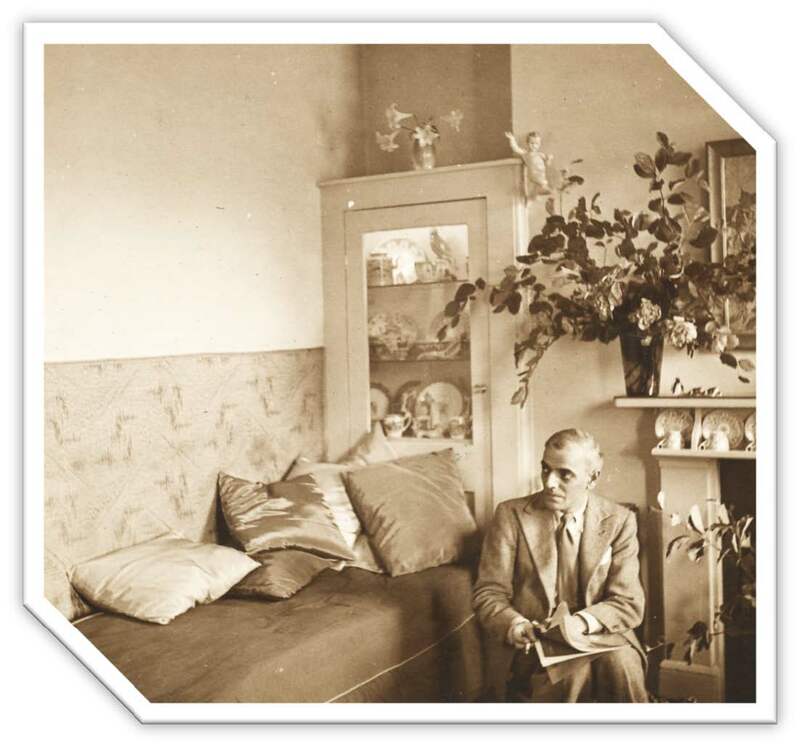 Marc in a mid-1930s photo in the sitting room of his flat at 10 Glebe Place in Chelsea. The “day bed” was where he regularly took a nap prior to his evening engagements and from which he invariably presided during his Sunday afternoon tea parties. Very little changed in his flat from one decade to the next. And so the war years came and, as for everyone else, Marc’s career took a significant hiatus. Many clubs were closed and those that stayed open were curfewed early. Some theatres went dark and those in the performing arts had to face even greater struggles than before. This is not to say that, despite the outbreak of war, there were no opportunities and Marc was able to find venues in which he could work, notably “The Spotted Dog” in Bruton Mews, which catered particularly to members of the armed forces. It was in this club in October 1940 that he was one of the victims of a bombshell, which destroyed the club and sent him and many others to hospital. Two died, but he was fortunate to have survived. Ironically, he had just finished a set and left the piano to join some friends for a drink, when the bomb landed and the piano took a direct hit. It turned out that the man who rescued him was Peter Churchill, a member of the Special Operations Executive and a highly decorated officer. The bombs may have been falling on London and evidence of the struggle against the enemy was everywhere, but that did not stop ordinary people from trying to live as normal a life as possible. 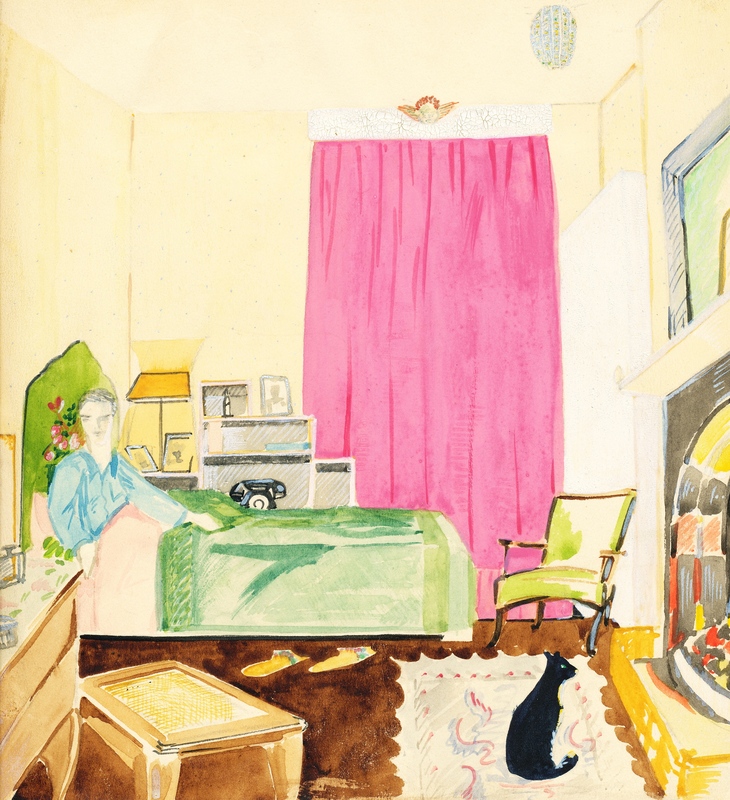 In 1942, a friend of Marc’s drew a rather simple but touching picture of him in his small bedroom at Glebe Place. Marc, as with the rest of the stoic British, needed their relief from the ghastliness of war. During this time, dance halls, theatres, picture houses and other entertainments did continue to survive the onslaughts of the enemy. In April 1942, the Vaudeville Theatre on The Strand featured Scoop, a production by Henry Kendall. The show was filled with contemporary stars, including Kendall himself, Charles Hawtrey, Nadine March and Joan Winstead. Though Arthur Young wrote most of the music, there was a wonderful section written by Marc called “Vienna Will Dance Again” with dialogue by Alan Melville.85 Ironically, in 1936 the BBC had offered Melville a job as scriptwriter in the variety department under Eric Maschwitz, the man who had previously turned down Marc’s Balalaika at around the same time. Melville was to go on to become one of the BBC’s most recognised broadcasters. The following year, Prince Littler presented a show at The Coliseum called It’s Foolish but It’s Fun in which Jimmy Nervo and Teddy Knox starred. For the first time, Marc was billed together with such musical contemporaries as Vivian Ellis and Ralph Reader. This show was to find great success not only in England but also on a worldwide tour, which went as far as Australia. every good thing possible for 1941 and may it be a crushing one to Hitler and Co that will lead to our victory and peace to the world. 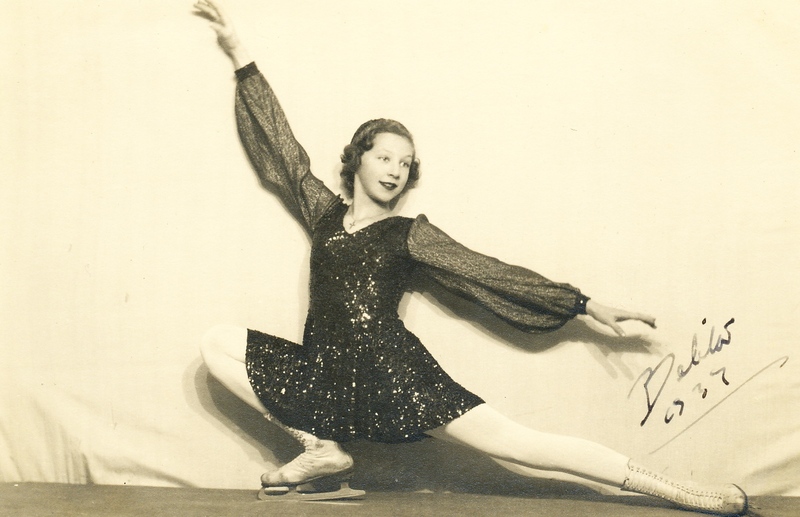 On January 7, 1949, Anton Dolin and Alicia Markova and their corps de ballet appeared at Earls Court with the Philharmonia Orchestra under the direction of Muir Matheson. One of the very many signed pictures of Dolin in Marc’s collection is the one with him and Markova, inscribed simply, “For Marc. Blessings”. As well as Anton Dolin and Alicia Markova, Nathalie Krassovska and John Gilpin were part of the first London season of the Festival Ballet. Marc attended several of the rehearsals and was invited as a guest for the opening night which was so successful that it became instantly clear that this new company was going to go from strength the strength, which indeed, it did. The young theatre designer Tom Lingwood. The London Academy of Music and Dramatic Art held its annual Revue in July 1953. In a wonderful twist of fate, the man who had left Penang to “study music in London” but had not done so; had chosen to invent his own musical vocabulary; continued to play by ear and memorise tunes; become the “King of the Night Clubs” and make a name for himself as a writer of waltzes and fox-trots, was to be asked to accompany the actors and singers in their graduation performances at LAMDA. One has to believe that Marc smiled ruefully to himself as he carried out his duties on this important occasion at the Academy’s Logan Place theatre. 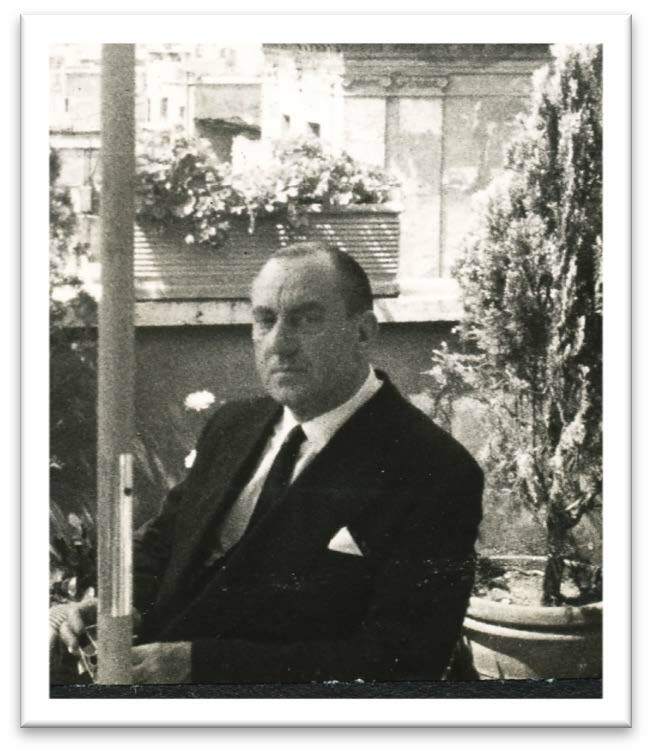 From 1956 Marc was appearing nightly at the Braganza Restaurant in Soho but his health was not as good as in previous years and the late nights were taking their toll. However, he remained the artist in residence there for the next four years. Within a few months, it was clear that Marc required something even gentler to see him into his twilight years. After all, he was now approaching 70 years of age and he had been performing for his different publics for nearly fifty years. 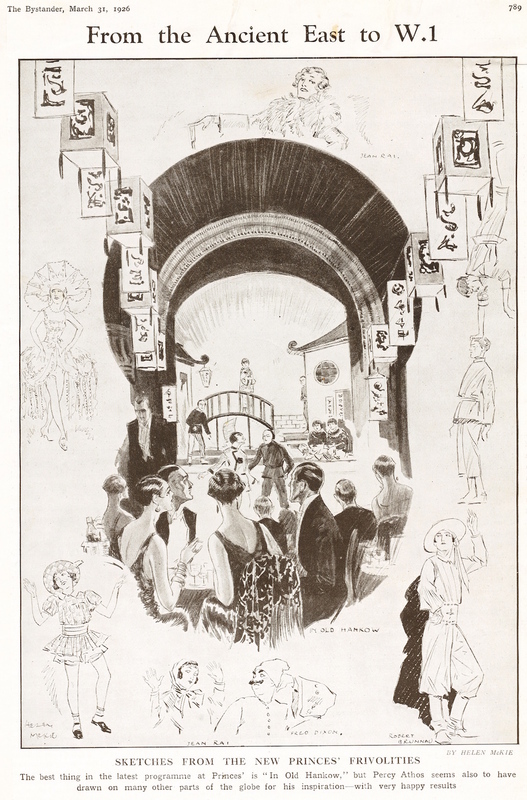 The Rockingham Club in Archer Street catered to those of alternative life styles and was certainly an attractive and popular venue. Pots of flowers and striped wallpaper greeted one on entry and there were numerous sporting prints and one large picture of the St Leger winner, Rockingham, after which the club was named. It was elegant and not inexpensive and attracted a good cross section of “high society”. The Rockingham, which achieved its own celebrity status and was a well-known destination for an extensive and high-powered membership, was to be Marc Anthony’s final working venue and he played there until only a few months before his death in 1970.
he thrilled his clienteles, nor even in the all-too-brief fame that he achieved with his wonderful songs, but in the social milieu of Chelsea and its environs and in his extensive coterie of entertainment industry friends. As we have discovered, Marc moved into Glebe Place in 1920 and lived there for 50 years until his death. He witnessed the enormous changes in London through the Depression, the two Great Wars and their repercussions and the changing scenes of the King’s Road throughout those times, including the Hippie movement of the 1950s and the punk culture of the 1960s. Marc’s charismatic and endearing personality has been referred to but the result of this was the way in which he was able to draw people from all walks of life towards him as if in a universal orbit to his nucleus of calm. As mentioned above, one of his greatest personal and professional friends was the great dancer, Anton Dolin, with whom he worked periodically over the years. Pat, which was his middle name and by which he was more intimately known, was a staunch admirer of Marc and encouraged him when he was failing to get his music performed or even accepted by publishers. Both followed each other’s careers with the greatest of pride in their respective areas and Pat was an ubiquitous supporter of Marc and his talent. 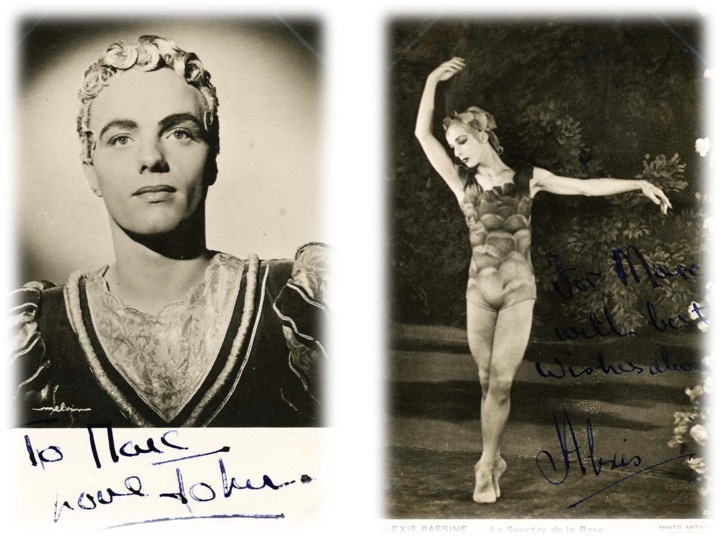 Although Dolin’s career took him around the world and he spent much time across the Atlantic, particularly during the time that he and Alicia Markova joined forces with their own touring company, whenever he was in London, he would meet up with Marc. Even on the occasions that he was overseas, he would keep in touch. I knew you would like this. They lunched with me today. See you soon. Love, Pat. For some years, Dolin and Markova appeared as guest Principals in the classic Roger Quilter fantasy Where the Rainbow Ends, which was an ever popular favourite, drawing on traditional heroic themes and in which Dolin played the part of St George. In one picture card that Dolin sent to Marc he wrote: “Marc: awful!! Love Pat”. It’s not clear whether he was referring to his photo in the costume of St George or to the production itself. We shall never know.98 What we do know is that for half a century Pat Dolin was a regular attendee at Marc’s Sunday soirees. In January 1962, the journalist Hannen Swaffer, or the Pope of Fleet Street as his colleagues named him, died. He was for many years a drama and music critic and it was he who, in 1930, had lauded homegrown musicians and had highlighted Marc as being one of the “brilliant young composers” who was being overlooked. At the end of that year, Marc’s first stage idol, Lily Elsie, died at the age of 76. He, who had been one of her “stage-door Johnnies” while still at school and who had seen her perform the part of Sonia in The Merry Widow on so many occasions, was devastated. It was largely through Lily Elsie, and the fact that he had seen her perform at Daly’s Theatre, that had convinced him that he wanted to write music for the stage and, one day, to have his own music performed at Daly’s. Although Lily Elsie had once had the world at her feet, her last years were spent quietly in her cottage in Palehouse Common in Sussex. played divinely, inspired. Every note sang, as beautifully as the great artiste you were playing for; our beloved José. Only you, no one else, could have brought that magic back with the touch of your fingers. Bless you. Love. … Pat. Largely through his friendship with Dolin, Marc also became close friends with many celebrities in the ballet world, particularly those associated with the London Festival Ballet (later to become the English National Ballet), which had been founded by Dolin and Markova. One of the ballet world’s greatest photographers, Gordon “Gorki” Anthony (the brother of Dame Ninette de Valois) became a frequent visitor to Glebe Place, as did John Gilpin, one of the company’s principal dancers and the Lithuanian-born, Alexis Rassine. Two friends of Marc from the world of dance: John Gilpin (left), Principal with the Festival Ballet and Alexis Rassine (right). Over the years, Marc had also befriended the young actor, Michael Redgrave and he (and subsequently the actor’s family) maintained a close personal and professional admiration for each other’s talents. At Christmas time in 1946, Marc received a charming “family portrait” card from the Redgraves, which he not unnaturally glued into his scrapbook with many other tokens from his distinguished list of acquaintances. Signed photo to Marc (left) from the young Michael Redgrave and a Christmas card (right) from the Redgrave family in 1946. Another close friend and frequent visitor to Marc’s flat was the extraordinary actress, May Hallatt, who was to achieve fame not only on the London stage but also in New York. Her most memorable performances were as Miss Meacham in both the stage and film versions of Terence Rattigan’s Separate Tables. May was married three times and her third husband was, according to her, “an odd man … and a planter in Malaya”. Perhaps this fact was an additional talking point between herself and Marc’s personal reminiscences of early childhood in the same country. She was also to pass away in 1969, the year before Marc. It would be less than riveting to have pages of pictures of all those celebrities who had come across Marc in his long professional career. Suffice to say that, in his scrapbooks and albums, he had kept a great many signed photographs, given to him by their subjects as tokens of their friendship and which he treasured as much as those first picture postcards he collected as a schoolboy in Clackmannanshire. 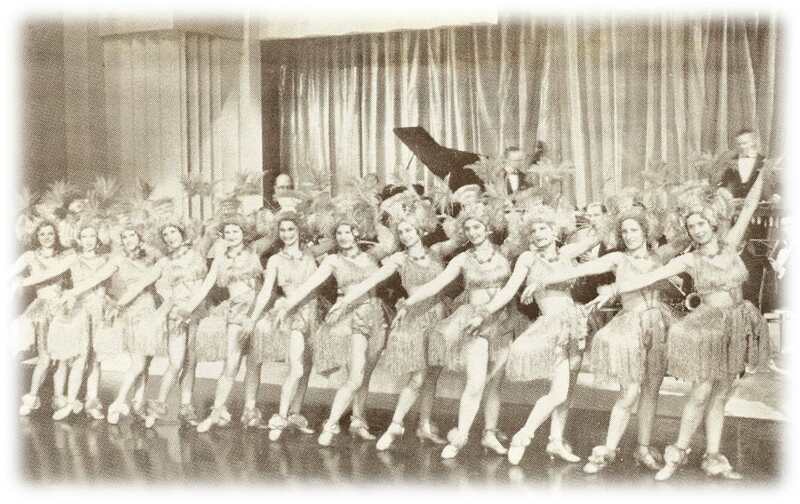 These included, amongst others, American actor, Tom Douglas; Canadian actress, Margaret Bannerman; international dancers, Sid Tracey and Bessie Hay; Ralph Whitehead, actor; pianist Maurice Ohana; Sally Rand, burlesque dancer and actress; continental chanteuse, Odette Athos; actor, Robert Stevens; June Hart and Jack Holland, professional ballroom dancers; African-American tap dancer brothers, Harold and Fayard Nicholas; Alan Sievewright, ballet and opera producer; May Costa, American actress and singer; American actor, Val Dufour; actress and Bohemian, Brenda Dean Paul; Peter Cushing, stage and film actor; Denny Gabin, actor; Sophie Tucker, American actress, comedienne and singer; television producer, Keith Beckett; Evelyn Laye, theatre and musical film actress; Gustav Wally, dancer, actor and theatre manager; dancer and choreographer, Freddie Carpenter; dancer Phyllis Bedells; John Murray Anderson, theatre director; actress and comedienne, Hermione Gingold and Anne Roselle, German soprano. All these recognized figures in their respective disciplines at some point and on many occasions crossed paths with Marc and many of them were frequent or occasional visitors to his London studio. Some mention has been made above about Marc’s Sunday afternoon tea parties and perhaps these need to be put into context. As previously stated, Marc began this exercise, which was to become a tradition and take on a life of its own, in the early 1920s not long after he moved into Glebe Place. But, as with all traditions, a certain etiquette grew with it and woe betide those who failed to live by his unwritten code! In the early days, when Marc would simply invite co-workers and colleagues along for “tea on Sunday”, there wasn’t much of a fuss made of it. When Lily Elsie came around with other members of the cast at the time to chat about the show or Pat Dolin came to relax after a busy week, it was just a place to let one’s hair down, allow Marc to play and enjoy the camaraderie. But Marc, being ever the consummate host, always went the extra mile and it was clear that Sunday tea, with bone china, cakes, scones and sandwiches beautifully presented, was something special. It needed “management” and on to the scene came one Mischa de la Motte. We need a few lines to describe this unique and fascinating character. Mischa was born in 1904 and became secretary to the actor, George Arliss, who was, incidentally, the first British and earliest born actor to win an Academy Award.102 Like Marc, Mischa was a club performer and cabaret artist but, in order to supplement his income from this, he became a film, television and stage extra, appearing for many years at Covent Garden in singing and non-singing walk-on roles. On ringing the door bell to Marc’s flat, Mischa’s head would peer out from above and a bunch of keys would drop to the pavement (or be caught, depending upon the visitor’s fielding skills) and one would make one’s way up to the second floor and into “the presence”. Usually, the guest would have brought a cake or biscuits or even sandwiches, though, depending upon the number on any particular Sunday, it might be necessary later for one of the guests to go out to the King’s Road and purchase a few more items. The front room of Marc’s flat was facing the tree-lined street and the main pieces of furniture in the room were a piano and a day bed, on which Marc would recline to entertain his friends. Chairs were brought in from other rooms when required but most people simply squatted on the floor or on cushions. Tea was always prepared either by the host or Mischa and the latter would make sure that everyone had plenty to eat and drink. It is hardly surprising, when one considers that these tea parties, which had hosted the most famous stars of stage and screen for half a century, were Marc’s most lasting legacy and would always be regarded as his greatest social achievement by those who were fortunate enough to be part of them. In the early 1920s, Marc began to cut articles and pictures from newspapers and magazines and stick them into scrap albums, one for each year. Predominantly these featured major news items of the day and, occasionally, something that, for whatever reason, caught his eye. There was a singular lack of consistency and logic in his cuttings but that is what makes them so much more an illustrative record of his times. In later years, the emphasis was quite heavily geared towards the various happenings of the monarchy and its extended family, which is highly reflective of the fact that, despite owing his ancestral origins to Persia and his family’s more recent association with Malaya, he saw himself as essentially English and acted as a true “English Gentleman” throughout his life. It seemed a natural extension for him to accept the Royal Family as part of an admirable institution to which he felt a great affinity and loyalty. Unaware of its proximity, in the months before his death he continued to do what he had always done. A slow walk down to the local Markham Arms pub for a glass of wine; meet with and entertain his friends; go to a show or, wearing his ubiquitous cardigan, play the piano in his flat in Glebe Place. 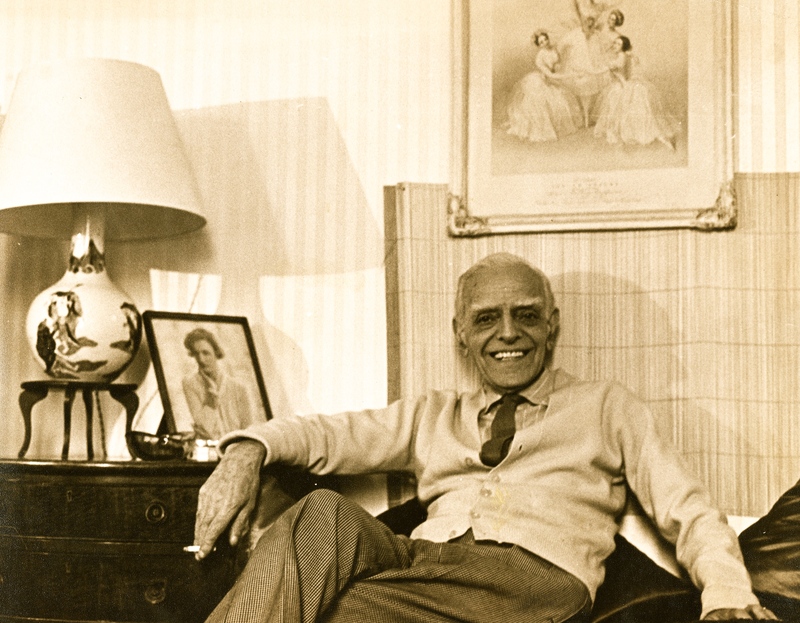 Throughout his life, Marc had been an avid theatregoer — his scrapbooks, which contain programmes from every form of theatrical entertainment from the 1920s until the 1960s attest to that. In his final months, he ventured to the West End to see, for example, The Secretary Bird at the Savoy Theatre; John Mortimer’s Come as You Are; Paul Scofield in Uncle Vanya; his old friends Mark Wynter and Evelyn Laye in Phil the Fluter; Carol Channing in her own show and Barbara Windsor in Sing a Rude Song. Chelsea will not seem the same place without that small, thin frame, brilliant dark eyes under such startling white brows, the aquiline nose and welcoming smile. The pleasures of tea time can never have been better demonstrated anywhere in the world. This is one of the last photographs of Marc, taken by Nesta MacDonald, as he relaxes in his Glebe Place flat wearing his trademark cardigan and, as always, a cigarette between his fingers.